Before the rise of the internet, being a business person was a costly endeavor for most people. It involved, among other things, having a large sum of money as capital without any guarantees that the business idea would be a success. Today, being a business person is not that risky because you can start small. You don’t need to build a brick and mortar store, and you can even sell digital products which make a physical store unnecessary. All you need is an idea for a product and the will to take action. 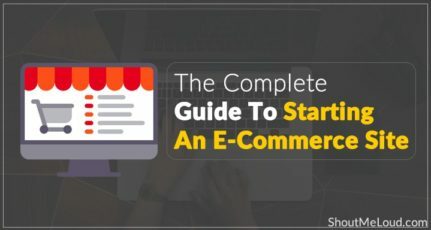 Of course, there’s also the technical part of building an online store. This is where eCommerce platforms come in. These are either free or paid services that let you host, build, and manage an eCommerce website. These services differ in features, appearances, and procedures, but all are aimed at letting you create a website where visitors can browse and eventually buy your products. Which eCommerce Platform To Use? We took a look at five of the biggest eCommerce platforms out there. 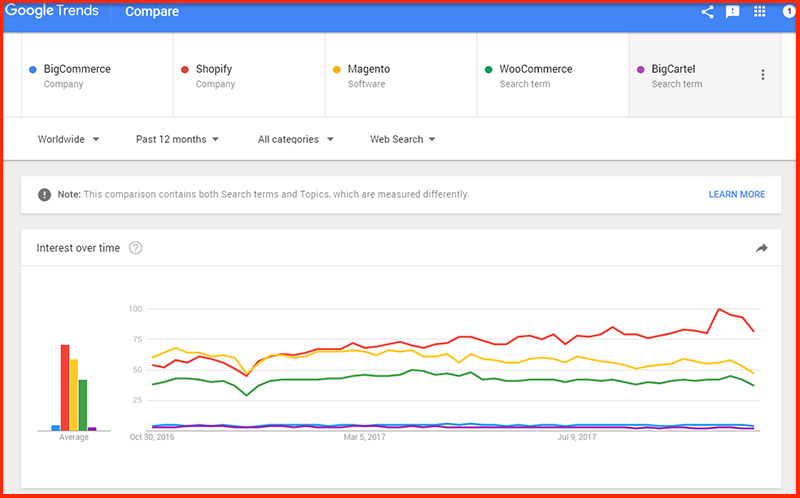 So the top three most searched for platforms are Shopify, Magento, and WooCommerce. Let’s look at all five of these platforms and see how they compare with each other. BigCommerce has been around since 2009 and is used by brands like Camelbak, Toyota, and Martha Stewart. It’s a full-featured software that manages everything from web hosting, web design, order processing, shipping, and analytics. You won’t have to go through the hassle of buying a domain if you don’t have one yet — BigCommerce can set that up for you when you sign up for their service. All plans also come with a free SSL which means your website will be secure and will protect customer payment information. Using its integration feature, you can sell on eBay, Amazon, Facebook, and Pinterest. It also integrates with POS software like Square and Shopkeep to record in-person sales. With BigCommerce, you can accept payments from PayPal, Braintree, Stripe, Authorize.net, and even digital wallets like Amazon Pay and Apple Pay. Standard Plan ($29.95/month) – Maximum of $50k sales per year. It also includes the most important features like the website builder, zero transaction fees, unlimited storage, and a dedicated SSL. Plus Plan ($79.95/month) – Maximum of $150k sales per year. Comes with more features like Customer Groups and Abandoned Cart Saver. Pro Plan ($249.95/month) – Maximum sales limit of $400k/year. Adds more features like a custom SSL, product filtering, and Google customer reviews. If you want to check out this platform, you can do so with their free 15-day trial (no credit card needed). Shopify was founded in 2006, and since then, the platform has hosted over 220,000 online retailers. That’s not that surprising seeing as how easy it is to set up an online store with this platform. 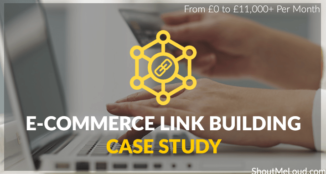 Compared to BigCommerce, Shopify is more user-friendly and any business owner without web development skills can have a shop up and running in minutes. In addition to ease of use, Shopify offers beautiful themes for your online store. Some of the themes are free, while others require payment. Premium themes cost around $140-$180 and they usually come in different layouts for more design options. Once you’ve added your products, you can manage them using Shopify’s built-in inventory section. You can also offer discounts and gift checks to your customers all from the dashboard. For anything else that you want to do or integrate with Shopify, you can head over to the Shopify App Store. Most integrations are free, but there are some premium ones that offer more advanced and specialized functions. 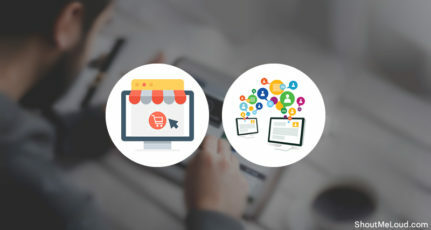 Basic Shopify ($13/month) – This plan will give you the basic website, blog, and store features including unlimited products, two staff accounts, and a free SSL certificate. Shopify ($54/month) – This increases the staff accounts to five and includes all Basic features. It also allows Abandoned Cart Recovery and Fraud Reports. 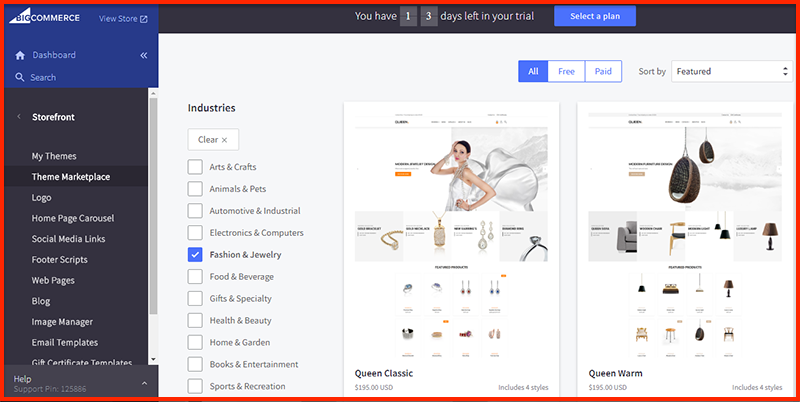 Advanced Shopify ($107/month) – Up to 15 staff users, includes all Basic and Shopify plan features plus Advanced Report Builder and third-party calculated shipping rates. All plans come with 24/7 customer support. Shopify offers a no-risk, free 30-day trial if you want to test it out. 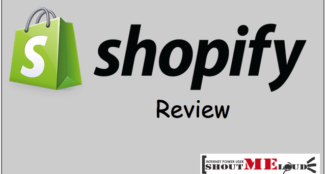 Also see: Shopify Review – Does Shopify Qualify to be Your eCommerce Partner? Magento is open-source software for building an eCommerce website. This means it’s free, just like WordPress. You can install it from your cPanel and build your store using the Magento Admin Panel. This platform is more advanced and may require you to hire someone who specializes in this system. The advantage of this is that you can customize every product as much as you want to. Creating groups, for example, allows you to show specific products to a certain group of people. 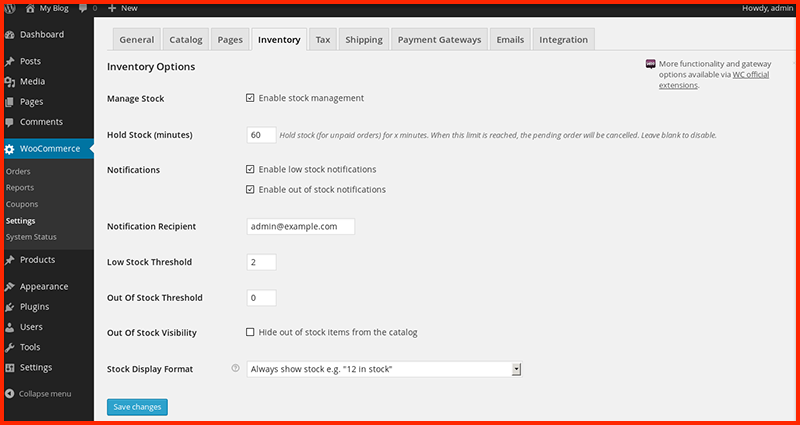 Other than product customization, you can manage pretty much anything else inside the Admin Panel. You can monitor sales, organize the catalog, manage customers, check abandoned carts, and create newsletters. These are similar to features offered by paid services like Shopify, but all at minimal cost. Magento itself is free to install. There’s a premium service called Magento Go which includes hosting. Extra integrations and themes may come with a price. WooCommerce is popular among WordPress users. In fact, it powers 28% of all online stores. Other than buying a domain and web hosting, using WooCommerce is completely free, but other extensions may require a purchase. Considering all other platforms in this list, WooCommerce wins when it comes to ease of use and affordability. 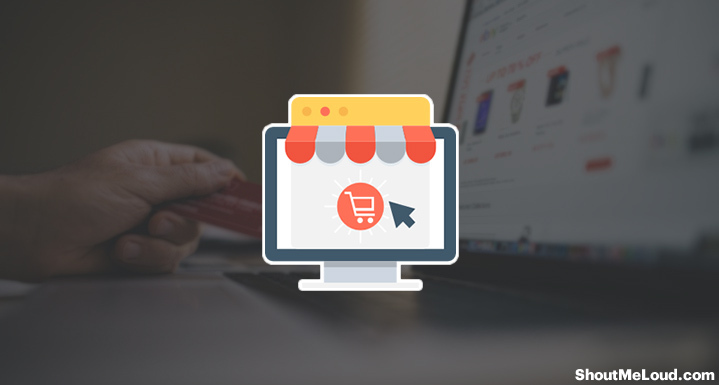 It provides the basic and most important features for you to get your online store running without spending a cent. It’s a perfect starting point if you simply want to manage a small store and see how it turns out. WooCommerce supports unlimited products and images, so you can add as many products and images per product as you want. You can customize products using product variation and set different prices. Payment can be made via a digital wallet like PayPal or more traditional ways like bank transfer or cash on delivery. Products can be shipped locally or internationally, or you can give an option for a customer to pick up the product. WooCommerce is free to install as a WordPress plugin. Free and premium extensions and themes are available from the WooCommerce marketplace. Unlike the first four platforms on this list, Bigcartel has a minimalist approach when it comes to selling products online. As stated on its website, this platform is meant for small businesses in the creative niche. Bigcartel has a free option which lets you sell five products on a store with a Bigcartel URL (mystore.bigcartel.com). If you want to use your own URL, you need to upgrade to any of the three paid plans. The paid plans increase the product limit and the maximum number of products allowed is 300. You can really feel the simplicity of this platform once you sign up and start the setup process. After adding your first product, adding categories, and setting up a payment processor, you are pretty much done. There’s a website builder similar to some WordPress themes, and here you can customize your site’s logo, text, and colors. Themes are available too if you want to change the overall appearance of your store. Free Plan (free) – Allows up to 5 products, order management, and Facebook integration. Paid Plan ($9.95/month) – Allows up to 25 products and has more features including Google Analytics and a custom domain. Diamond Plan ($19.99/month) – Allows up to 100 products. Titanium Plan ($29.99/month) – Allows up to 300 products. Not all businesses are the same. For this reason, you need to seriously consider which platform is right for your business. -How many products are you planning to sell? -Who are your target customers? 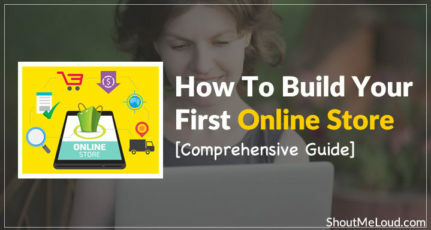 -Are you going to build your website on your own, or will you be hiring someone? -How much are you willing to spend? -If you were a customer in your own store, which features would make your shopping experience pleasant? Once you’ve answered these questions, you should have a better understanding of what your ideal store would look like and how to achieve that goal. With most undertakings, this could be trial and error. Hopefully, with this article, you can make a better decision that won’t lead to any errors at all. Let me know which platform you chose and what you think about it in the comments below! Wonderful list of e-commerce platforms. However, I had some experience in past with Magento and I really like it. Whilst technology and platforms are evolved so much in recent years. Shopify is today one of the best and popular e-commerce CMS. Thanks again for sharing these great lists. Nice Information, I have use only woo commerce, Easy to use and customize. Shopify is my second best choice. As per your Description, I am sure rest of three E commerce Platforms also very good. 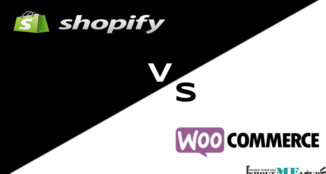 WooCommerce is the best eCommerce platform because it’s free. I am a big fan of woocommerce and using for my clients. And practicing other e-commerce platform. Thanks for introducing the all features of popular e-commerce platforms. Thanks for grouping up all the best E-commerce platforms in one place. I used to suggest Magento to my clients for creating E-commerce stores,but all of them personally prefer shopify. Shopify has made a huge reputation and i’m sure its gonna make more too in coming days. I plan to use woo commerce in future.Thanks, Kim this article will help me to gain. I feel woo commerce is the best! Being a wordpress plugin always has its advantage ;-).. It has so many in built features, plus there a dozen paid plugins that add more to its functionalities.